gah! after a day like yours, i’m not sure that i’d want to get back to work either: manicures + macaroons!! I just finished my book last night and don’t know what I feel like reading next! Any recommendations? And I can totally relate to the sunday night blues. Although, I’m a shift worker – so the blues aren’t on a specific weekday! Just work blues in general. I think it’s one of those ‘grass is greener’ situations; I always assumed people who had shift schedules were happier because they had flexibility (what I wouldn’t give to go grocery shopping mid-week!) but you make a really good point. I only really anticipate the “back to work blues” Sunday nights. I don’t know how I’d feel if I had them on a random Thursday! I want to say foggy days always make me want to stay in bed…but really, anything other than a sunny day makes me want to stay in bed :-) those pj pants are oh so pretty. J’adore ta panoplie pour rester à la maison et ne pas mettre le nez dehors avec ce froid! 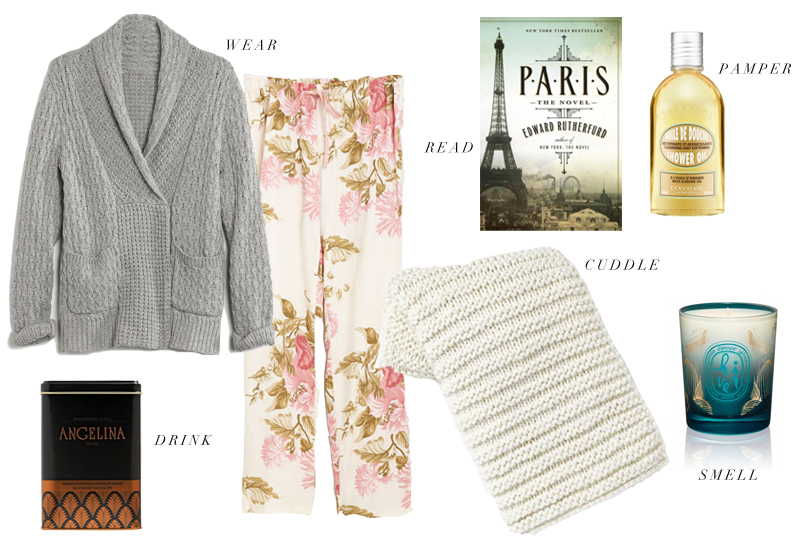 La petite veste en laine bien chaud, le pantalon cosy et un bon livre avec un chocolat chaud…what else? It has just hit hot chocolate weather around here and I’m ready. I fell asleep in front of the fire last night, so I must be really ready, for all these things, actually. I am really taking advantage of hot chocolate weather so far. Trader Joe’s sells a good organic powder mix if you’re in the market! I haven’t cracked open Edward Ruthfurd’s “Paris” yet; though, I’m anxiously awaiting it once I regain my vision and sanity after required textbook reading. I’ve already shoved my nose and inhaled that wonderful candle. I don’t want to be an enabler, but it’s good. You’ll like it once you dive in. It’s my first Edward Rutherfurd book, believe it or not! I can understand needing a break though after reading textbooks, haha. “Paris” isn’t a light undertaking, even if it is for pleasure.